You all know that I am a big fan of whitening soaps. My goal has always been to find out the best whitening soap available in the Philippine market that works for me. CY Gabriel in Special Pink for example is something I swear by for years now as well as Belo Intensive Whitening Soap which I finished about five cartons already. I have used these two whitening soaps on and off and they always give me positive result. In my experience whitening soaps are more effective than whitening lotion because I see real results in less than a week. READ: Let's Talk About Lotion. Today I'd like to introduce you to two new soaps but this time I use them mainly on my face instead of body. I am currently using a herbal soap for my body because I developed skin asthma on my shoulder and back for some reason. 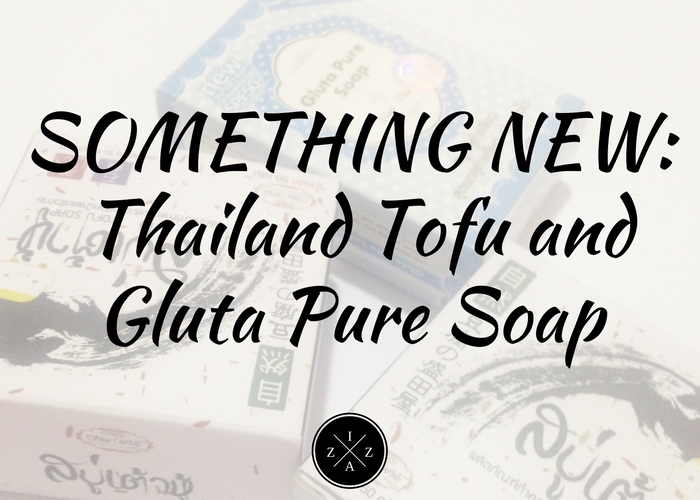 Anyway, here is Something New for you, Thailand's Tofu and Gluta Pure Soap. I was strolling shops inside Pop Culture when I heard a group of college girls haggling a certain store for some whitening soaps. As soon as they left I asked the sales lady about the soap they were talking about and the name and the price. I found out about Thailand's Tofu and Gluta Pure Soap. The Tofu Soap is one of the best sellers in Thailand. It became famous thanks to testimonials posted in social media. I learned that each Tofu Soap are made from raw materials and imported ingredients from Japan. The main language used in the packaging is Thai so I don't have that much information to share. There's a cute pic instruction though you need to see for instruction on how to use. How I Use It? Among the two Thailand soaps I bought I still currently use this Tofu Soap . Just like the picture I first splash some water on my face. Next I form a nice foam on my hand before I lather on my skin. Then I let it rest for 1-2 minutes before rinsing. I use this once every night. How Much? I bought mine for 65pesos. Try to go inside Pop Culture Trinoma to try this Tofu Soap because most Instragram and Online shop sell it for 100pesos ++. Thailand's Tofu Soap smells like vanilla which I really really like. I also notice how it gives tingling sensation on the face whenever I leave it for 1-2 minutes. I love how refreshing (as well as the squeaky clean) feeling it gives right after use. I've been using this for two weeks already and I feel like my skin is whiter and brighter. My pores are actually less visible and I don't become that oily anymore. I have experienced a smoother and softer face plus it is non-irritating, non-drying and no side effects whatsoever for me. Another great result for me is the "botox-effect" after wash. I can feel my face is tighter than before use. I believe each Tofu Soap have soy bean extract (tofu) and Vitamin E which are both good for the skin. I love the fact that the product comes with a plastic packaging aside from the box. The only downside is that there are no English instruction available. This soap doesn't easily melt which is a plus factor. I bought the Gluta Pure Soap because I intend to use it for my body. It is packaged in a very cute box that will really caught your attention. Aside from glutathione, the Gluta Pure Soap has Goat's Milk, Vitamin E, Vitamin C and Vitamin B3 which makes it an effective whitening soap. How I Use It? This soap only lasted a good week to week and a half for me since I use it mainly on my body. This melts faster than the Tofu Soap which is a con in my opinion. What I do is use my Kyosoku Bihaku Scrub to exfoliate my body with this Gluta Pure Soap from Thailand. How Much? I bought mine for 65pesos too inside Pop Culture Trinoma. For my body I didn't see that much result to be honest. I do love the milky scent and its something I always look forward to whenever I use it. This leaves my skin very moisturized after use. I saw improvements on the texture of my skin, no more flaky and dry skin. Like the Tofu Soap on my face I also try to leave this 1-2 minutes. Though I sometimes forget to put lotion after use this Gluta Pure Soap still maintains the moisture on my body. I enjoyed using but soaps but I guess I won't buy the Gluta Pure Soap anymore. I will however repurchase the Tofu Soap as soon as I finished the one I am currently using. What do you think of these Thailand Soaps? Have you used one?